By the arrangements of the Canadian federation, Canada's monarchy operates in Quebec as the core of the province's Westminster-style parliamentary democracy and constitution. As such, the Crown within Quebec's jurisdiction is referred to as the Crown in Right of Quebec (French: couronne du chef du Québec), His/Her Majesty in Right of Quebec (French: Sa Majesté du chef du Québec), or the Queen in Right of Quebec (French: la reine du chef du Québec). The Constitution Act, 1867, however, leaves many royal duties in Quebec specifically assigned to the sovereign's viceroy, the Lieutenant Governor of Quebec, whose direct participation in governance is limited by the conventional stipulations of constitutional monarchy. The role of the Crown is both legal and practical; it functions in Quebec in the same way it does in all of Canada's other provinces, being the centre of a constitutional construct in which the institutions of government acting under the sovereign's authority share the power of the whole. It is thus the foundation of the executive, legislative, and judicial branches of the province's government. The Canadian monarch—since 6 February 1952, Queen Elizabeth II—is represented and her duties carried out by the Lieutenant Governor of Quebec, whose direct participation in governance is limited by the conventional stipulations of constitutional monarchy, with most related powers entrusted for exercise by the elected parliamentarians, the ministers of the Crown drawn from amongst them, and the judges and justices of the peace. The Crown today primarily functions as a guarantor of continuous and stable governance and a nonpartisan safeguard against the abuse of power. This arrangement began with the 1867 British North America Act and continued an unbroken line of monarchical government extending back to the early 16th century, making Quebec the oldest continuously monarchical territory in North America. However, though Quebec has a separate government headed by the Queen, as a province, Quebec is not itself a kingdom. A viceregal suite in the André-Laurendeau building in Quebec City is used both as an office and official event location by the lieutenant governor, the sovereign, and other members of the Canadian Royal Family. The viceroy resides in a separate home provided by the provincial Crown and the Queen and her relations reside at a hotel when in Quebec. Those in the Royal Family perform ceremonial duties when on a tour of the province; the royal persons do not receive any personal income for their service, only the costs associated with the exercise of these obligations are funded by both the Canadian and Quebec Crowns in their respective councils. Monuments around Quebec mark some of those visits, while others honour a royal personage or event. Further, Quebec's monarchical status is illustrated by royal names applied regions, communities, schools, and buildings, many of which may also have a specific history with a member or members of the Royal Family; for example, Quebec has at least seven distinct features named for Queen Victoria, including the second largest area in Canada and Grand lac Victoria at the head of the Ottawa River, south of Val-d'Or. Gifts are also sometimes offered from the people of Quebec to a royal person to mark a visit or an important milestone; for instance, Queen Elizabeth II was in 1955 given the puck with which Maurice Richard scored his 325th career goal—thereby setting a new record—during a game against the Chicago Blackhawks on 8 November 1952. Associations also exist between the Crown and many private organizations within the province; these may have been founded by a Royal Charter, receive a royal prefix, and/or be honoured with the patronage of a member of the Royal Family. Examples include the Royal Montreal Curling Club, which is under the patronage of Prince Philip, Duke of Edinburgh, and received its royal designation from King George V in 1924, and McGill University, which was originally constituted as the Royal Institution for the Advancement of Learning through royal charter by King George III in 1801, before being reconstituted as a university by George IV in 1827. The main symbol of the monarchy is the sovereign herself, her image (in portrait or effigy) thus being used to signify government authority. A royal cypher or crown may also illustrate the monarchy as the locus of authority, without referring to any specific monarch. Further, though neither the monarch nor her viceroy form a part of the constitutions of Quebec's honours, the latter do stem from the Crown as the fount of honour; unlike in all of Canada's other provinces, however, the insignia do not bear any royal emblems. Quebec lawyers may be appointed Queen's Counsel. Advocates of independence or sovereignty for Quebec are generally hostile to the Crown in Quebec, regarding it not as a distinct and essential part of the province's national structure—"the last bulwark of democracy," as former Liberal Quebec premier Daniel Johnson, Jr. put it—but as a federal institution involved in Quebec affairs. Most of those in the sovereignty movement also do not recognise the Canadian monarchy, referring to it instead still as the "British monarchy" or "English Crown". Some sovereignists ask that Canada's royals apologise for acts such as the Acadian Great Upheaval in the mid 18th century (which the Crown recognised in 2003) and the patriation of the Canadian constitution in 1982. In 2009, the Société St-Jean Baptiste's Montreal chapter asked Prince Charles to apologise for what it said was the Royal Family's role in the "cultural genocide of francophones in North America over the last 400 years". The province's sovereigntist political party, the Parti Québécois (PQ), has pushed for reforms: at a constitutional conference held in Ottawa in February 1968, delegates from Quebec indicated that a provincial president might suit the province better than the Queen and a lieutenant governor, but the proposal was not accepted. In an interview in 1971, the then leader of the PQ, René Lévesque, when asked if there would be any role for the monarchy in an independent Quebec, responded: "Are you joking? Why? I have great respect for the Queen... but what the hell part should monarchy have in Quebec?" University of Toronto professor Richard Toporoski held the theory that a sovereign, not independent, Quebec would still be under the sovereignty of the Queen: "...the real problem of the Quebec bill is not separation from Canada: Quebec has said that it wishes to preserve common elements—Canadian currency (issued officially by whom?—the Queen of Canada), for example, and the possibility of Quebec citizens being Canadian citizens (and who are Canadian citizens?—subjects of the Queen)." Sovereigntists have also been against the presence of members of the Canadian Royal Family in Quebec. At the height of the Quiet Revolution, the Quebec press reported that extreme separatists were plotting to assassinate Queen Elizabeth II during her upcoming 1964 tour of the province, as well as to kidnap Premier Jean Lesage's son, should the Queen come to Quebec. Despite fears for the monarch's safety and talk of cancelling the trip, the Queen arrived as planned and, in a speech delivered to the Legislative Assembly on 10 October, in both French and English, spoke of Canada's two "complementary cultures" and the strength of Canada's two founding peoples; she stated: "I am pleased to think that there exists in our Commonwealth a country where I can express myself officially in French... Whenever you sing [the French words of] 'O Canada' you are reminded that you come of a proud race." Still, as her motorcade passed through Quebec City, the route was lined with Quebecers showing their backs to the monarch; others booed her and shouted separatist slogans. Though the protesters were the minority in the crowds gathered to see the Queen (the Montreal Gazette reporting that those who opposed the visit were students numbering in the hundreds) the provincial police violently dispersed those demonstrators who took to marching through the streets, arresting 36, including some who had been there to show loyalty to the Queen. Lévesque later sent a letter to Buckingham Palace asking the Queen to refuse Prime Minister of Canada Pierre Trudeau's advice that she open the 1976 Summer Olympics in Montreal, though she did not oblige the premier, as he was out of his jurisdiction in offering advice to the sovereign on a federal matter. The premier at the time, Robert Bourassa, who had first pushed Trudeau to ask the Queen to attend, eventually himself became unsettled about how unpopular the move might be with sovereigntists. In 2002, Premier Bernard Landry directed the executive council and lieutenant governor not to recognise Elizabeth's golden jubilee, in protest of the Queen's signing of the Constitution Act, 1982; separatist demonstrators met the Queen when she entered Gatineau that year. PQ members of the National Assembly of Quebec also complained in 2006 about federal intervention into a provincial affair and separatists threatened demonstrations after both the city and provincial governments mused about inviting the Queen or another member of the Royal Family to attend the festivities marking the quatercentenary of the founding of Quebec City, as had been done a century prior. Though it was met with dissatisfation from some officials in Quebec, but with support from 64% of polled individuals in the province, the federal government advised neither the sovereign nor any other Royal Family member to attend, instead sending Governor General Michaëlle Jean to preside over the fête. The Saint-Jean-Baptiste Society and Réseau de Résistance du Québécois (RRQ) mounted demonstrations and threw eggs at Canadian soldiers during the visit of Prince Charles and Camilla, Duchess of Cornwall, to the Black Watch Regiment in Montreal, on Remembrance Day, 2009, requiring the intervention of riot police. The RRQ mounted similar, though less violent, protests when Prince William and Catherine, Duchess of Cambridge, visited Montreal and Quebec City in 2011. Prince George, Prince of Wales, was present for the celebration of Quebec City's tercentenary in 1908, The events were popular with Quebec residents, leading Prime Minister of Canada Wilfrid Laurier to opine that Quebecers were "monarchical by religion, by habit, and by the remembrance of past history." Into the 1960s and 1970s, however, Quebec nationalism grew and created an atmosphere in which the Canadian monarchy was a target of anti-federal, anti-English sentiment. Exactly 60 years later, however, Premier Daniel Johnson mused about making Quebec a federated republic. ^ Sparling v. Quebec , [1988 2 S.C.R. 1015] (Supreme Court of Canada 15 December 1988). ^ Committee for the Equal Treatment of Asbestos Minority Shareholders v. Her Majesty in Right of Quebec, Ontario Securities , [2001 2 S.C.R. 132, 2001 SCC 37] (Supreme Court of Canada 7 June 2001). ^ Oujé-Bougoumou Cree Nation v. Canada , T-3007-93, 5.24, 5.25, 5.30 (Federal Court of Canada 1 December 1999). ^ a b c MacLeod, Kevin S. (2008). A Crown of Maples (PDF) (1 ed.). Ottawa: Queen's Printer for Canada. p. 16. ISBN 978-0-662-46012-1. ^ Privy Council Office (2008). Accountable Government: A Guide for Ministers and Ministers of State – 2008. Ottawa: Queen's Printer for Canada. p. 49. ISBN 978-1-100-11096-7. Archived from the original on 24 September 2009. Retrieved 17 May 2009. ^ Office of the Lieutenant Gouverneur of Quebec. "History > Office > The Office of the Lieutenant Governor of Quebec". Éditeur officiel du Québec. Retrieved 5 July 2009. ^ "Royal Statues". Canadian Royal Heritage Trust. Retrieved 5 July 2009. ^ Rayburn, Alan. "Victoria". The Canadian Encyclopedia. Retrieved 15 September 2007. ^ The Royal Collection. "e-Gallery > Exhibitions > Queen & Commonwealth > Gifts > Ice hockey puck". Queen's Printer. Retrieved 26 July 2009. ^ "Founded in 1807, The Royal Montreal Curling Club is the oldest active athletic club in North America". The Royal Montreal Curling Club. Retrieved 5 July 2009. ^ Elizabeth II (1 October 2008). "An Act respecting the Ministère de la Justice". 16. Quebec City: Éditeur officiel du Québec. Retrieved 5 July 2009. ^ Jackson, Michael D. (2007). "The Crown in Today's Federal State" (PDF). Canadian Monarchist News. Toronto: Monarchist League of Canada. Autumn-Winter 2007 (27): 11. Archived from the original (PDF) on 8 July 2009. Retrieved 5 July 2009. ^ Phillips, Stephen (2007). "Republicanism in Canada in the Reign of Elizabeth II: the Dog That Didn't Bark". Canadian Monarchist News. Toronto: Monarchist League of Canada. Summer 2004 (22): 19. Archived from the original (PDF) on 16 December 2009. Retrieved 5 July 2009. ^ a b "Society > The Monarchy > 1964 Quebec riots". CBC. Retrieved 5 July 2009. ^ a b "Flying eggs, pro-Quebec slogans greet Charles". CTV. 10 November 2009. Retrieved 8 March 2011. ^ Elizabeth II (31 December 2003). "Proclamation Designating July 28 of Every Year as "A Day of Commemoration of the Great Upheaval", Commencing on July 28, 2005" (PDF). Canada Gazette. Ottawa: Queen's Printer for Canada. 137 (27): 3202–3203. Retrieved 14 March 2010. ^ "News and Events > Minister Copps announces a day of Commemoration of the Great Upheaval". The Acadian Museum. 10 December 2003. Retrieved 14 March 2010. ^ a b "Charles must apologize: Quebec sovereigntists". CBC. 30 October 2009. Retrieved 7 March 2011. ^ "Charles must apologize: Quebec sovereigntists". CBC. 30 October 2009. Retrieved 20 September 2013. ^ Michener, Roland (1971) [19 November 1970]. "The Empire Club of Canada Speeches 1970-1971". Toronto: The Empire Club Foundation. pp. 130–149. Retrieved 10 February 2009. ^ "Politics > Parties & Leaders > René Lévesque's Separatist Fight > René, The Queen and the FLQ". CBC. Retrieved 5 July 2009. ^ "Queen won't be at Quebec City's big birthday bash". CBC. 10 December 2007. Archived from the original on 19 June 2008. Retrieved 5 July 2009. ^ Toporoski, Richard (1996). "A Subject Speaks: Separation & The Crown". Monarchy Canada. Toronto: Monarchist League of Canada. April 1996. Archived from the original on 8 October 2007. Retrieved 5 July 2009. ^ a b "Courage of the Queen". Canadian Royal Heritage Trust. Retrieved 22 February 2010. ^ Toporoski, Richard (June 2006). "Can the Queen Grant Royal Assent in a Provincial Legislature? : No" (PDF). Canadian Monarchist News. Toronto: Monarchist League of Canada. Fall-Winter 2005 (24): 19. Archived from the original (PDF) on 26 March 2009. Retrieved 5 July 2009. 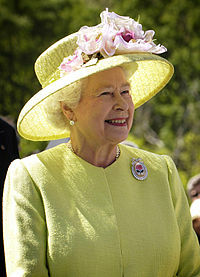 ^ "Elizabeth II, Queen of Canada". Canadian Royal Heritage Trust. Archived from the original on 1 May 2010. Retrieved 5 July 2009. ^ "Society > The Monarchy > 1964 Quebec visit - speech". CBC. Retrieved 5 July 2009. ^ Pape, Gordon (12 October 1964). "Queen Joins Call for Constitution's Need of Updating". Montreal Gazette. p. 1. Retrieved 24 February 2010. ^ a b "Society > The Monarchy > Truncheon Saturday". Canadian Broadcasting Corporation. Retrieved 22 February 2010. ^ Bantey, Bill (12 October 1964). "Queen Ends Visit After Receiving Invitation To View Quebec's Progress At Later Date". Montreal Gazette. p. 1. Retrieved 24 February 2010. ^ Phillips, Stephen. "Republicanism in Canada in the reign of Elizabeth II: the dog that didn't bark" (PDF). Canadian Monarchist News. Toronto: Monarchist League of Canada. Summer 2004 (22): 19–20. Archived from the original (PDF) on 8 July 2009. Retrieved 10 February 2009. ^ "Queen not on the list for Quebec City birthday bash". CTV. 12 October 2007. Retrieved 17 February 2009. ^ Canadian Press (26 December 2007). "Quebec City's 400th birthday stays under radar". CTV. Retrieved 17 February 2009. ^ Patriquin, Martin (7 July 2008). "Not Everyone's Happy about Quebec's Birthday Party". In Marsh, James Harley (ed.). Maclean's Magazine > Not Everyone's Happy about Quebec's Birthday Party. The Canadian Encyclopedia. Toronto: Historica Foundation of Canada. Retrieved 16 March 2009. ^ Department of Canadian Heritage. "Ceremonial and Canadian Symbols Promotion > The Canadian Monarchy > The Royal Presence in Canada > A Historical Overview". Queen's Printer for Canada. Retrieved 14 July 2008. ^ Toporoski, Richard (1998). "The Invisible Crown". Monarchy Canada. Toronto: Monarchist League of Canada. Summer 1998. Retrieved 5 July 2009. ^ Chevrier, Marc (2001). "Our Republic in America". In Venne, Michel (ed.). Vive Quebec! : new thinking and new approaches to the Quebec nation. Toronto: James Lorimer & Company. p. 92. ISBN 978-1-55028-734-9. This page was last edited on 4 October 2018, at 06:00 (UTC).